On paper, restaurant week is a great idea. If you haven’t heard of restaurant week, it’s a week out of the year where the restaurants of a community offer special prices and menus to drive people to local dining establishments. Pretty cool, right? Eat local! Spend local! I’m for it. Until the restaurants and organizers of restaurant week try to execute the event online. What happens is the organizers cobble together a horrible looking website using every font available in their publishing platform, hastily throw up a Facebook page and attempt – but fail – to provide prospective diners with the necessary information. I’m not talking about the dates and the list of restaurants themselves. What I’m talking about is what every diner who searches for a restaurant online is looking for: the special restaurant week-only menu. Aside from reviews on Facebook and Yelp, the menu is a key factor in the decision making process for which establishment gets our money. What are you serving? Do I like it? Will my friends/kids/family/co-workers who have gluten-free/picky eating/vegetarian issues be able to enjoy anything on your menu? For some reason, restaurant week event organizers don’t get this, and they link to everything else besides the menu in their Facebook posts. They link to the Facebook pages of participating restaurants, the restaurants’ homepages, and their aforementioned terrible event website. All the links on the event’s website are also typically to the participating restaurants’ homepages. Although they did a good job reminding fans and posting delicious food photos, after post after post on one local restaurant week’s Facebook page linked to everything but the menus. Linking to the homepage of a restaurant does not bring me to the restaurant week menu because restaurants typically build a special page for it. The restaurant owners and workers and their marketing folks know where to find it – they spend every day on their website. But the prospective customers who may use restaurant week to try you out have no idea where that special menu is or how to get to it. They don’t use your site every day, and they are not going to spend more than 2 clicks trying to find your menu. So you’re going to get a scenario like the one I experienced with my friends this week. We picked a day, and then chatted on Facebook messenger to find a restaurant we could all agree on. The local restaurant week’s webpage listed the homepage of 18 participating restaurants. After a few tries of searching and failing to find the restaurant week menus, we decided to try the restaurant week of another nearby town. We found the same situation with the next town’s website, and they had 42 restaurants listed. Who has the time or energy to look all over the interwebs to find the restaurant week menus of 42 restaurants? 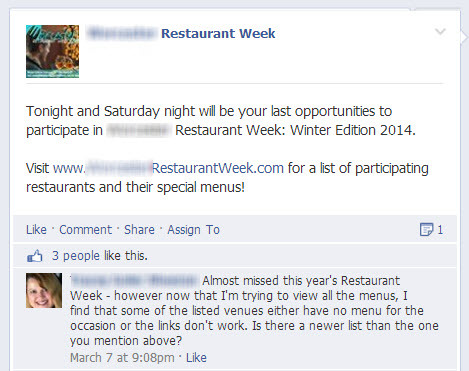 Restaurant week fail. We gave up. Do not make customers work to complete a call to action. They will give up. So my point is this: If you want people to do something, link to the thing you want them to do. This is not just for restaurant week. This is for any marketing anyone does anywhere, no matter if you’re doing it for an event or your business. 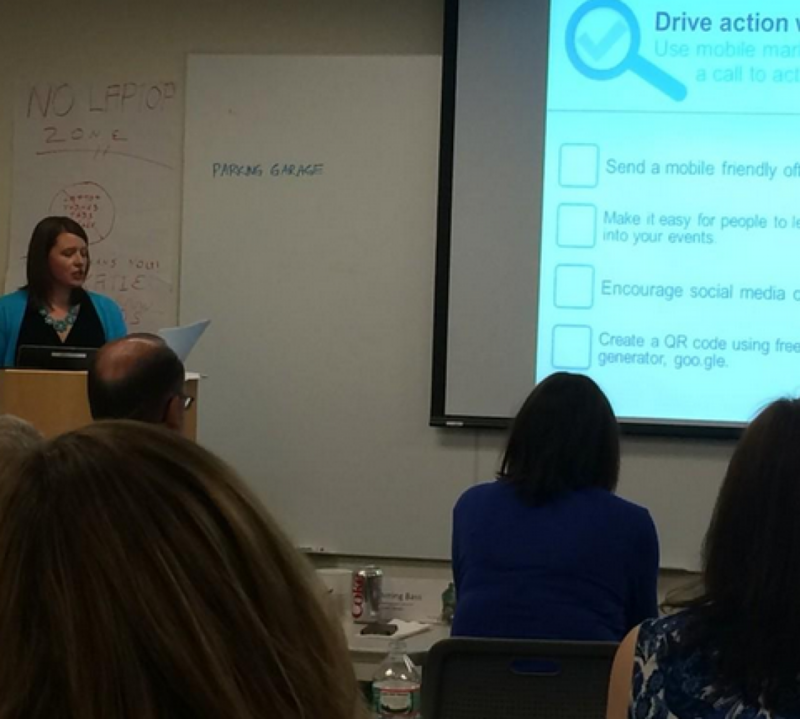 Do not make people work to follow through on the call to action. It’s that simple. You want people to come to your business. Make it easy for them to come to your business. You spend a lot of time and money on your websites and social media marketing. You want prospective customers to view all the pages of all the fabulous things you have to offer. I get it. Just get them there first. If they want to come back, and want to learn more by perusing your Facebook posts and website, they will.